Two separated superstructures. Suspension bridge with pylons only on one side. At the other side anchorage of the cables directly in a wall of rock. Variably inclined, crossed hangers. Hollow box cross section, composite structure. Steel hollow box suspended from the main bridge. Sections of superstructure are transported by ship, suspended from the cables and connected. Pouring of the deck with movable formwork. 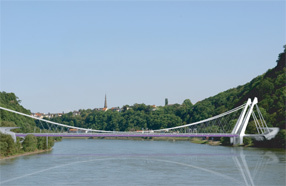 The target of the design has been the creation of a slim bridge which little affects the Danube valley but underlines the character of the landscape. The basic idea of anchoring both ends of the cables in the slopes was dropped for nature protection reasons. 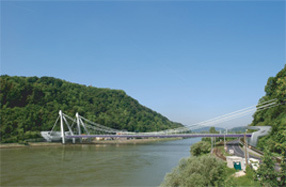 The sculptural shaped A-Pylon should be a symbol for the dynamic development of Linz.